Only Gatlinburg Falls Resort offers you a one-of-a-kind getaway to the Smoky Mountains sure to satisfy your desire for relaxation, comfort, and excitement. Premier locations just seconds from the Parkway in Pigeon Forge. Luxury cabins at INCREDIBLE SAVINGS. Why not have your cake and eat it too! Check out these awesome values. See available cabins for this special here! Call toll free 866-347-6659 for details. The perfect getaway for two. Honeymoon. Anniversary. Or just a special weekend. 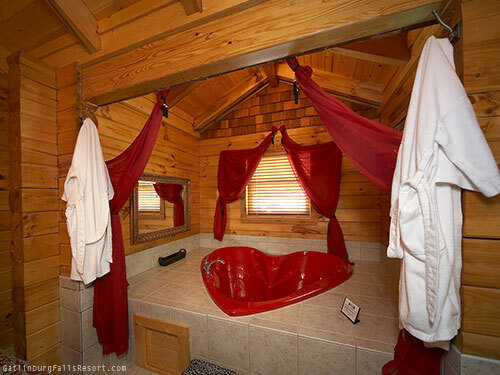 The most romantic luxury log cabins in the Smokies. Hot tub overlooking spectacular views. Vertical, jetted shower spa with two jets and two shower heads. Two cable TVs with premium channels. Add a dozen roses or bed of roses. Or a bath basket. Or a candlelight dinner for two. For great rates, call 866-347-6659 to surprise your sweetheart. * Offer valid on remaining nights only. Not available for existing reservations. Free nights offer represent the least expensive night of the stay. Restrictions apply.